Our 33rd issue is all about the Nintendo Switch and its software lineup! Nintendo finally revealed most of the details for the Switch at a live-stream event in Japan on January 13, 2017. We got our first detailed glimpse of the hardware itself, the various controllers / accessories, and also the many first-party games that are planned for 2017. One of the major announcements of the event was that The Legend of Zelda: Breath of the Wild will launch with the Switch on March 3. 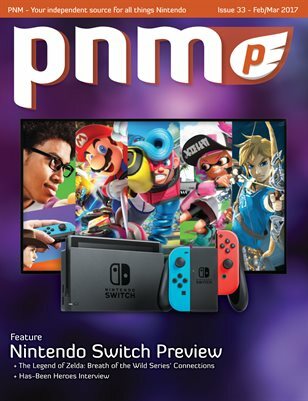 Many of the features in this issue revolve around the Switch and Breath of the Wild so you’re in for a treat with concept art, previews, discussions on the Switch pricing, and also the many connections Breath of the Wild has with past Zelda games. We also have the final voting for our 2016 Game of the Year Awards so be sure to check out the results and also the latest reviews and new fan art! Happy Gaming and enjoy Breath of the Wild!